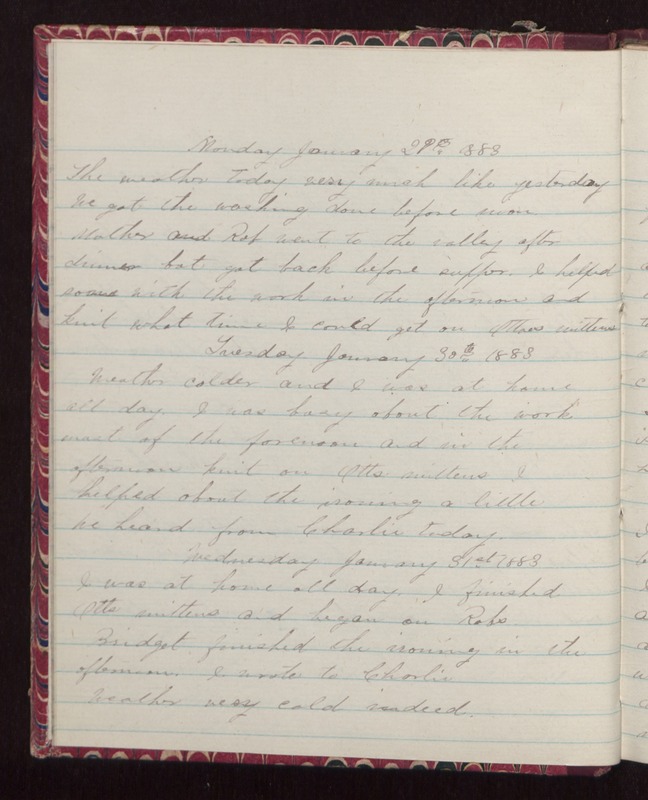 Monday January 29th 1883 The weather today very much like yesterday We got the washing done before noon. Mother and Rob went to the valley after dinner but got back before supper. I helped some with the work in the afternoon and knit what time I could get on Ottoes mittens. Tuesday January 30th 1883 Weather colder and I was at home all day. I was busy about the work most of the forenoon and in the afternoon knit on Otts mittens. I helped about the ironing a little We heard from Charlie today. Wednesday January 31st 1883 I was at home all day. I finished Otts mittens and began on Robs. Bridget finished the ironing in the afternoon. I wrote to Charlie Weather very cold indeed.